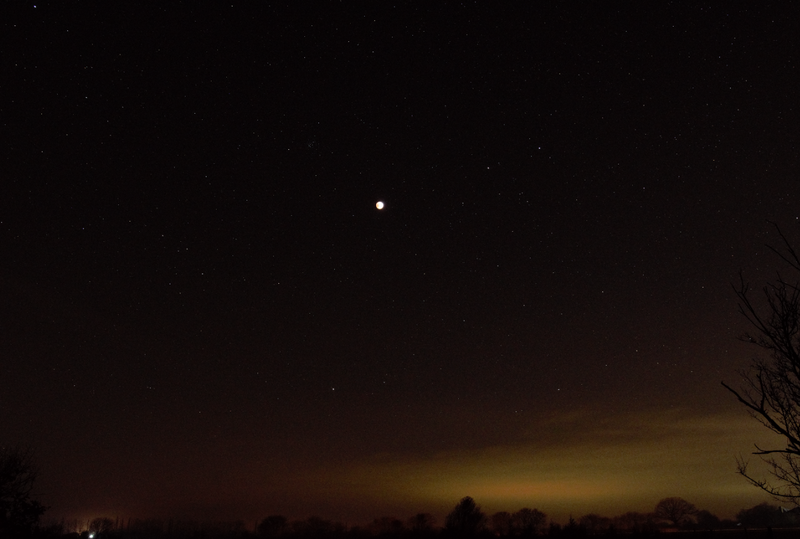 Total lunar eclipse 21.01.2019 seen from Burrow village in Suffolk. 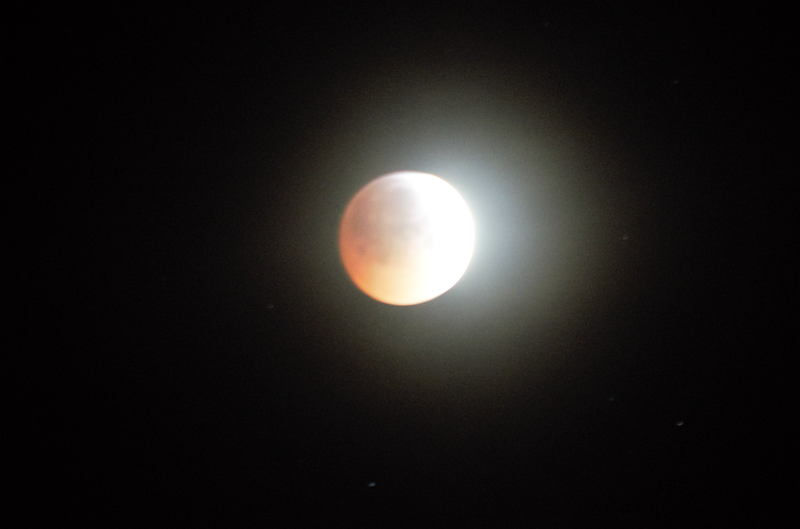 A total lunar eclipse occurred recently on Monday 21st of January (Pic. 1). For me it was a next opportunity to see this rare phenomena, especially because I couldn’t make it in July 2018, due to thundery weather. This time the weather forecast seemed to be more favourable a few days before the eclipse, although as the eclipse night approached the forecasts were turning into similar scenario. Finally, a day before the eclipse the weather maps were predicting a cropshoot, at least in Cambridgeshire area, because further south east was going to be better. Pic. 1 Total lunar eclipse 21.01.2019 graph (Eclipse.gsfc.nasa.gov). Sky brightness changes caused by the eclipse (3-5min period at lunar azimuth) – which was going to be a confirmation of my considerations, that arose out of previous two total lunar eclipse observations. Unlike to the most successful 2015 total lunar eclipse observation so far I had got a DSLR camera with Sigma f/1.8 lenses for this purpose. 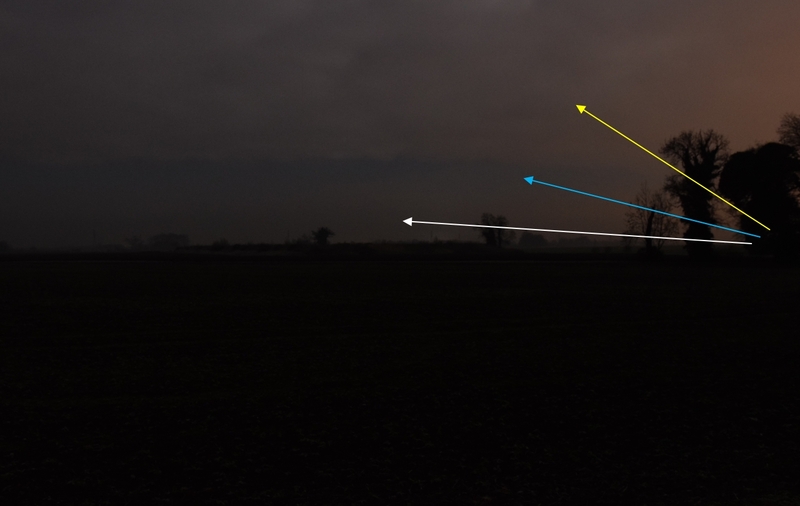 Recording the light transition occurence produced by gradual hiding a lunar disk in the Earth’s shadow. Mapping the shadow movement at particular lunar locations i.e Tycho Crater, recording the moments of time. I could do this throughout a Sky Watcher 1200mm telescope borrowed from Cambridge Astronomy Association. 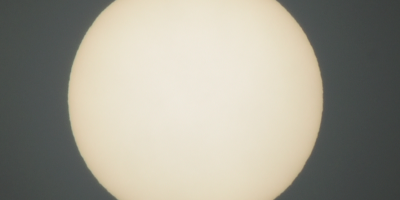 Creating an eclipse timelapse with using a Nikkor 300mm long lenses with 2min periods. All this stuff required a big commitment and focus, so despite a slow progress of the eclipse I was not planning hang around even for a minute. Just in case of worst weather I planned change my location within some reasonable distance from home. For this reason I planned to wake up as late as 2am bearing in mind, that my newborn daughter won’t let me sleep at all. The weather verified my plans badly. Waking up from time to time I saw how the sky is becoming congested with low level clouds. When I finally woke up at 1.30am the sky was fully overcasted. When I looked on the weather radar the clouds covered all area down to London and Southend area, making no point to go somewhere. However about 2pm the sky suddenly cleared up, letting a Moon shining through. I unpacked my gear and went outside. Then a huge cloud covered the Moon, although an extended section of clear sky moving at eastern direction. I repacked my equipment to the car and left my house. Firstly I stopped in Horningsea to make sure is really a necessity to waste a precious eclipse time and go somewhere, when weather is better? 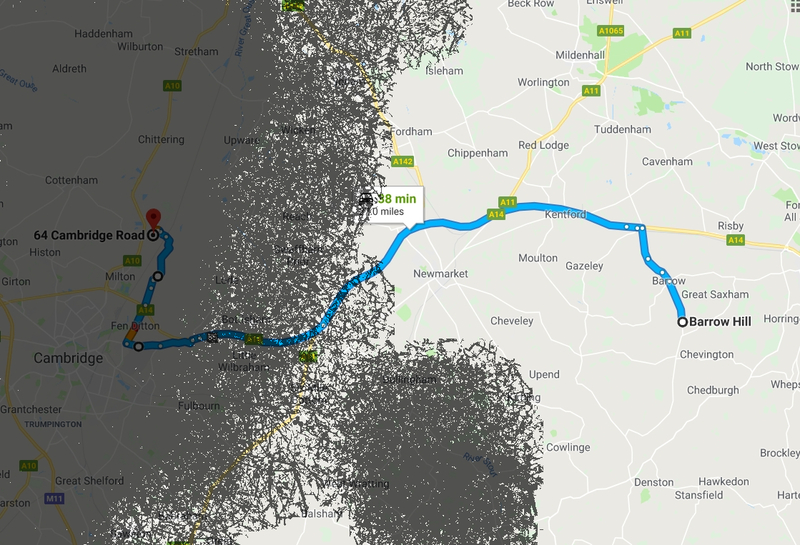 My weather app was showing recently emerged big hole in clouds north from Cambridge, although it wasn’t accurate enough to tell me roughly where should I move or should I really drive somewhere at all. Being at Horninhsea for a while I spotted Moon shining through some small holes in the clouds. Thinking, that weather is improving I set my equipment again and start watching the prenumbral phase. Pic. 2 My equipment set near Horningsea, only for a while. Unfortunately the clouds with no mercy covered all western part of the sky eventually. Surprisingly I spotted a clear skies far beyond eastern horizon (Pic. 3, 4). It motivated me to go there. Pic. 3 An extended clear section of sky above eastern horizon seen from Horningsea at 3.10am, where: yellow arrow – thin stratocumulus clouds with a lot of smallish gaps, occuring much rarely towards western part of the sky; blue arrow – clear blue skyl white arrow – low stratus deck seen just above the horizon. Pic. 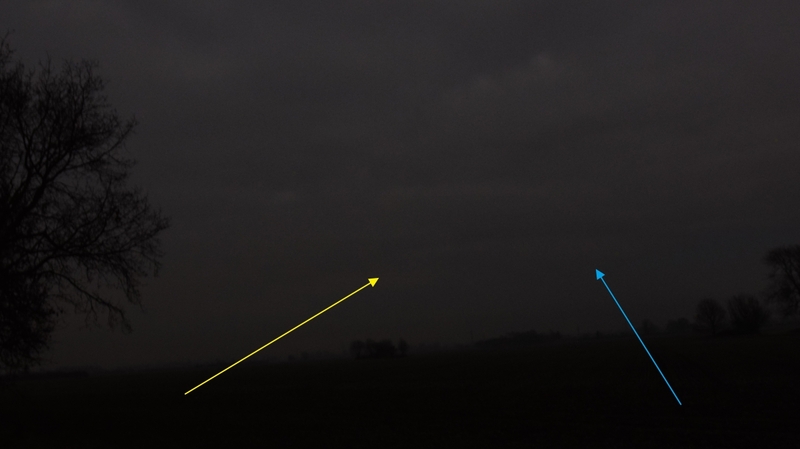 4 An extended clear section of north-eastern sky seen from Horningsea (blue arrow) with a small yellowish glow from Soham seen roughly at the sharp edge os stratocumulus clouds (yellow arrow). Pic. 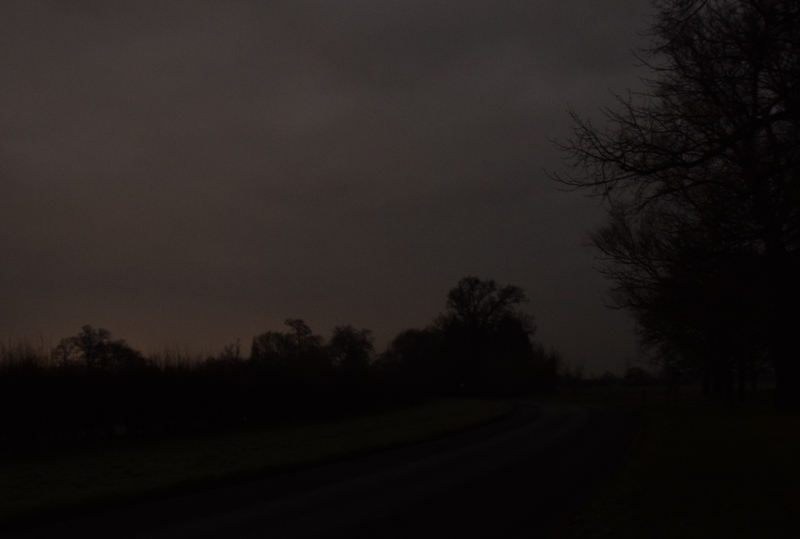 5 Northern section of sky seen from Horningsea (towards Waterbeach) – no chance for clarity at all. Pic. 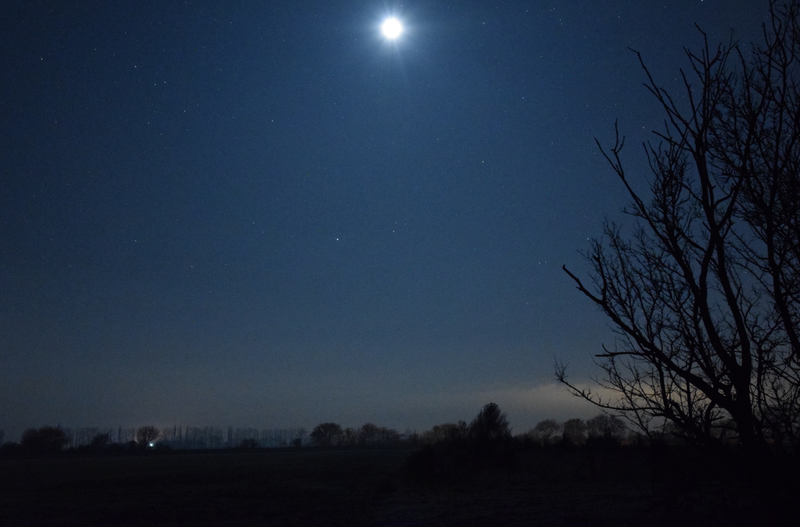 6 Situation in Horningsea at 3.20am – cloud gaps getting smaller, giving no chance for a fainting Moon appearance. After taking my gear into the car I set, heading eastwards on motorway towards Newmarket. The motorway was nearly empty about 3.30am so I could go fast with safety. From time to time I was taking a glance on the sky through a windshield. Passing by Newmarket I saw the stars with no clouds. Pic. 7 Presumed cloud cover around 3.30 am against my escape route. Awesome! I though, but I had to go further, leaving the clouds behind, far on western sky. Hurtling towards Bury St Edmund’s I spotted an partially eclipsed Moon in a right side mirror. Then I started seeking for the nearest junction, where I could turn out from motorway somewhere onto a rural area. Finally I reached a Burrow village, just before Bury St Edmund’s. Going southwards I could admire a beautiful half-eclipsed Moon completely free of clouds. It was awesome view. After a few kilometres driving I finally stopped behind the village. This time setting an equipment again was a bit harder, due to increasing darkness. A moonlight was too faint to help me out with screwing up the telescope gear and tripod. Pic. 8 Setting the gear near Burrow village. Officially I started my observation at 4:05. Initially I was watching the Moon through the telescope, afterwards I started to take some random pictures. Watching the eclipse through the lower eyepiece was a perfect experience. With nearly 110x enlargement I could see how the full shadow line is moving across the lunar disk. In this zoom all celestial bodies moves throughout a field of view quickly due to Earth rotation, which is multiplied proportionally to zoom factor. However an eagle eye can spot how the shadow velocity oversteps the “speed” of single craters being in the vicinity. Due to lack of Nikon adapter I was trying to capture some images by smartphone. They were not sharp enough, though not as bad as I guessed before. Pic. 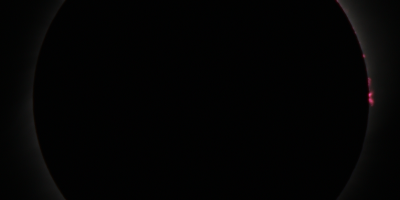 9 Partially eclipsed Moon shining above Burrow village at 4.20am; 18mm, f/4.5, ISO 8000. Pic. 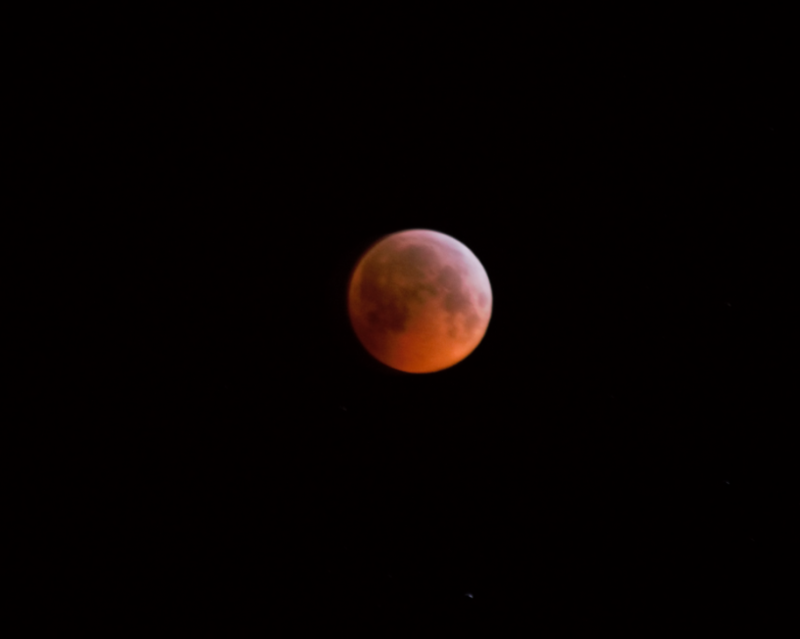 10, 11 Partially eclipsed Moon as seen from Burrow; 300mm, f/5.6, ISO 3200 10s and 1s. Pic.12 A full shadow line seen through 9.7mm eyepiece in 1200mm Skywatcher telescope. Captured by Samsung Galaxy S5 smartphone. In general I covered the moment of the biggest light dropping before P3 contact. Watching the last beam of moonlight I spotted approaching stratus clouds, which was strongly illuminated by Newmarket light glow. It made me rush and nervous. In the result I was taking a pictures in a haste, without a decent positioning, making them not sharp enough eventually. Pic. 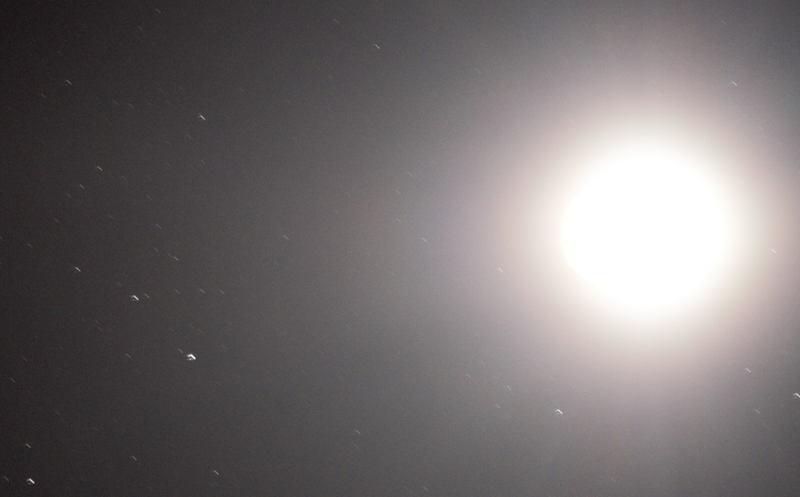 13 Last beams of moonlight before total phase; 35mm, f/4.5, ISO 3200, cropped. Pic. 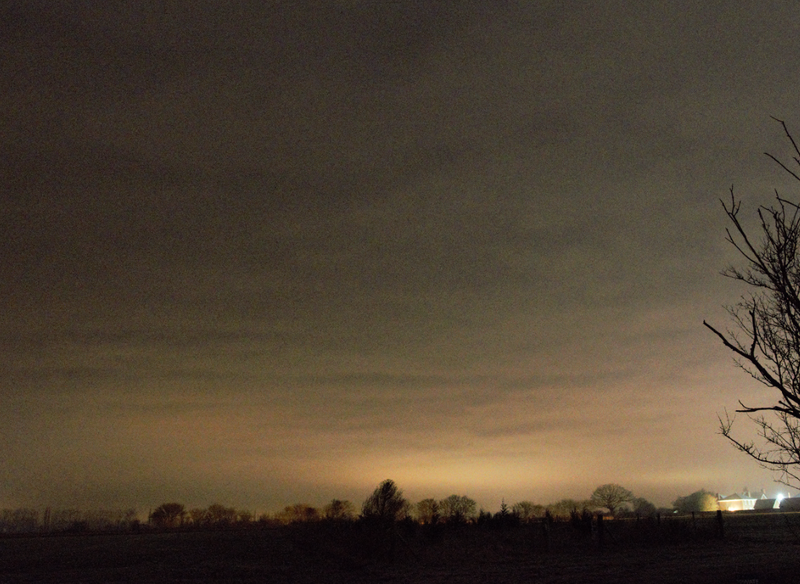 14 Total lunar eclipse seen from Burrow village at 4:45am with approaching stratus clouds, illuminated by Newmarket glow. Pic. 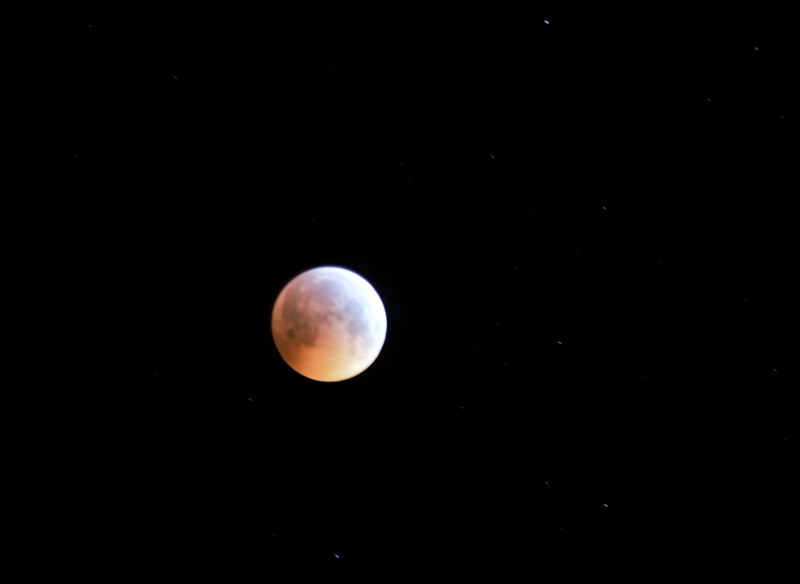 15, 16 – Total lunar eclipse seen from Burrow village; 300mm, f/5.6, ISO 3200 and 1600. 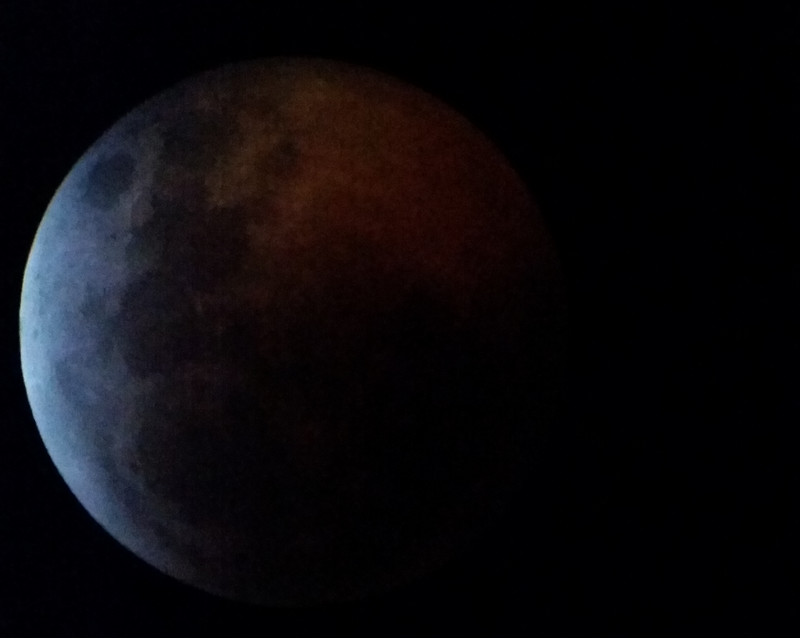 In the meantime I was watching the darkening Moon through the telescope and taking the pictures by smartphone (Pic. 17). First minutes of totality were very interesting. The Moon appearance contained basically 2 colours: a bluish – brighter one and reddish – slightly darker. The bluish tint arises out of thin Earth’s atmosphere which affect a solar beams just after U2 or before U3 contact. As the totality at particular part of the Moon is deeper, then this colour turns into more red due to thick Earth’s atmosphere affection. It works analogically to diffuse sky radiation process, as we can observe every day on Earth. Shorter waves scatter blue light, longer more redder, about which I wrote more here. Anyway this is only a simple conclusion, which will be more developed in the future. Pic. 17 Total lunar eclipse seen through 16mm eyepiece in 1200mm SkyWatcher telescope, captured by Samsung Galaxy S5 smartphone. 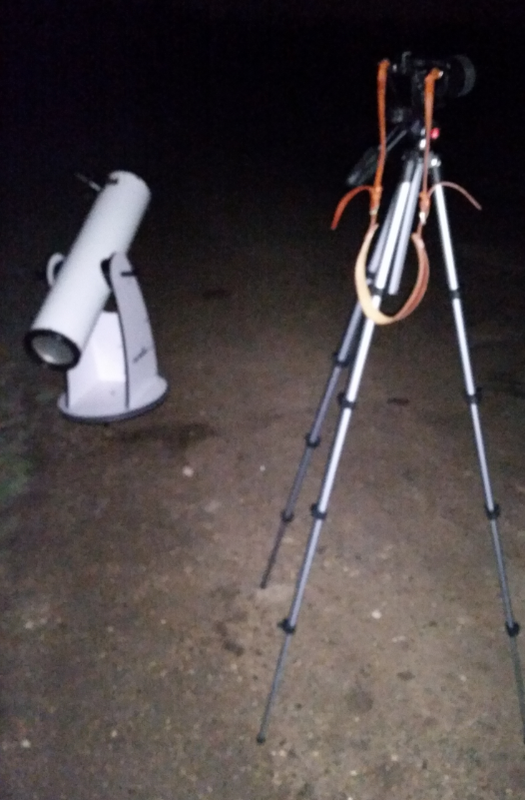 My observation of the total phase was shortened because of clouds, that approached about 4.55am. For next 10 minutes I was watching the Moon through the thinner or thicker blanket of stratus, trying to make some photos. Once it dissapeared I looked around and spotted fleeting clear sky down towards south-eastern horizon. 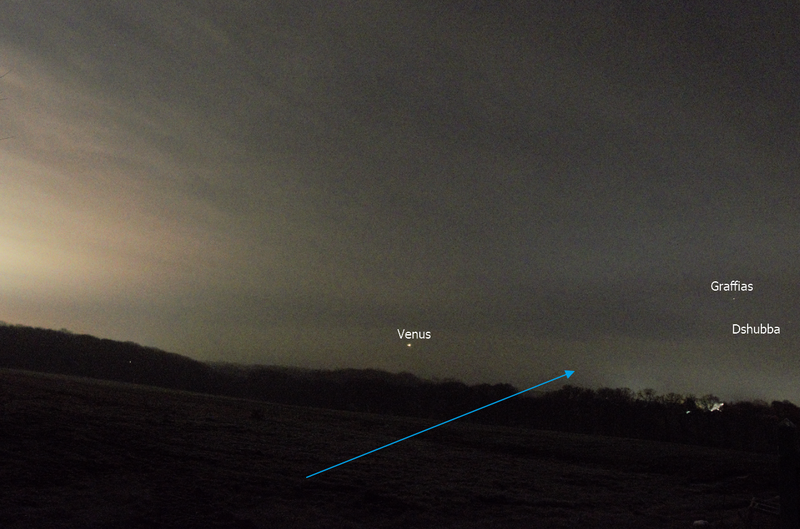 I could see a rising Venus for a while, when I was packing back my stuff again! Pic. 18 Cloud deck covering a western section of sky with eclipsed Moon at 5.05am. Pic. 19 Rising Venus with some bright stars in the Scorpius constellation seen above south-eastern horizon at 5.05am. Blue arrow shows a visible clear section of sky, which dissapeared soon. Having a recent real-time cloud cover in my app (Pic. 20,21). I decided to fight for the lasting halt, driving down through the villages south of Bury St Edmund’s, but this time in vain. 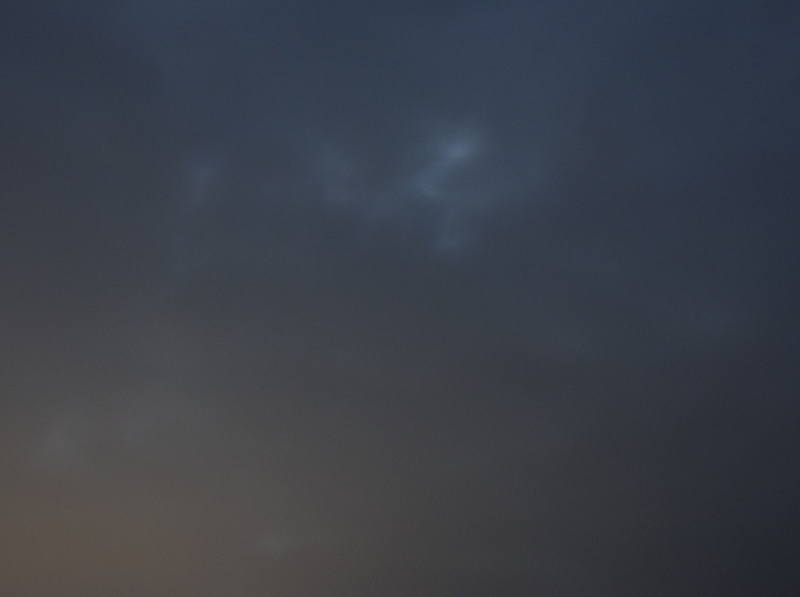 Clouds covered a whole sky, even without any gap (maybe a small one at zenith). 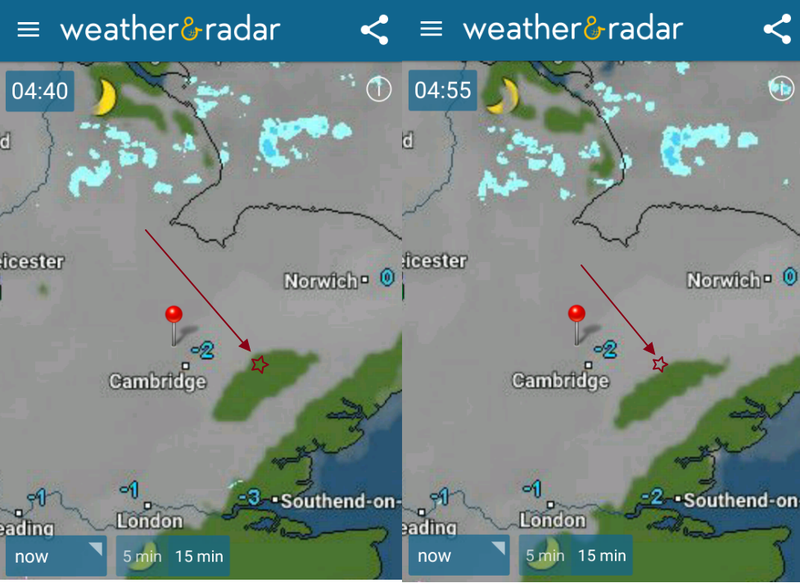 The newest satellite imagery also shown, that a big hole in clouds was arleady gone at 5.25 am and the closest region with clear skies was around Ipswich, twice further from my observation point. 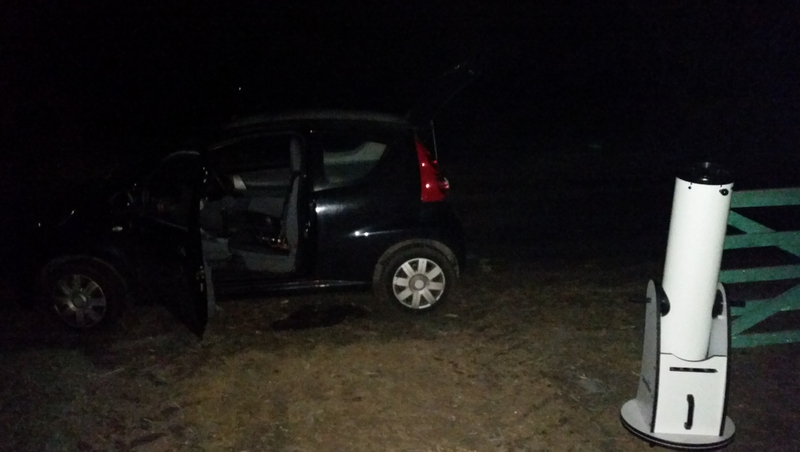 Because I couldn’t make it this time, even in a rush on motorway (it was only 15 min left to the end of the total eclipse) I decided to retreat from further attends. Pic. 20 Cloudiness above East Anglia with observation venue marked. About 5.30 I terminated my fight with weather and decided to back home. On the way down I was trying to see an eclipsed Moon through the windshield, but clouds were too thick. Moreover the weather became misty. On top of that the road towards Cambridge was busy, so I had to be careful. I was successful eventually, although with no reasonable observation result. My observation was quite messy and photos not good enough. Packing the equipment took too much time. Another attendant watching this occurence with me would be beneficial. At least it was much better, than previously in July 2018, when I saw completely nothing. For further circumstances such this I would like to give you a few advises once you set your observation point anywhere and suddenly found, that weather is not enough. 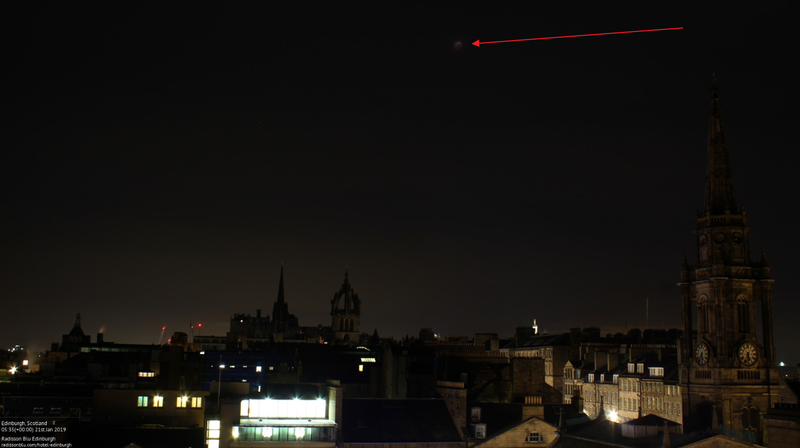 After the eclipse I saw the occurence on a couple webcams: in Edinburgh (Pic. 21) and the Tenerife (Pic. 22), when weather was nice. Pic. 21 Eclipsed Moon seen above Edinburgh at 5:35 UTC (Deckchair.com). Pic. 22 Setting Moon in prenumbral phase of the eclipse, seen from Tenerife at 7.05 UTC (Deckchair.com). 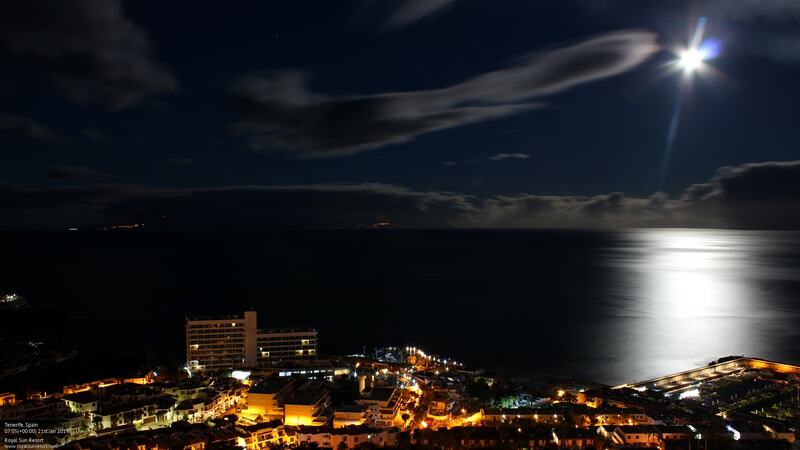 Thanks to the Tenerife webcam I could fill up the last remote lunar eclipse observation, watching the moonlight reflection on the Atlantic Ocean surface (Pic. 23). 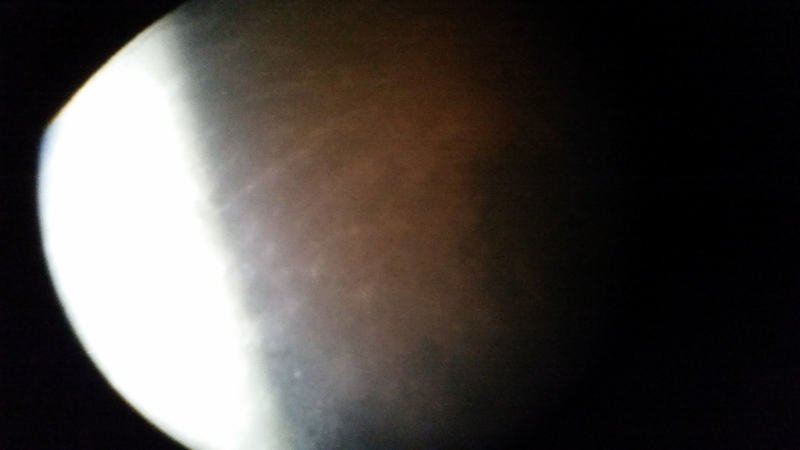 I found, that a lunar beams started to be visible about 20 min after U3 contact. The details of my observation you can see below. Maybe you will do a better watching with use more ISO-sensitive devices in the future. Pic. 23 Moonlight reflection on the Atlantic Ocean surface seen from Tenerife during the reverse sequence of lunar eclipse (Deckchair.com). 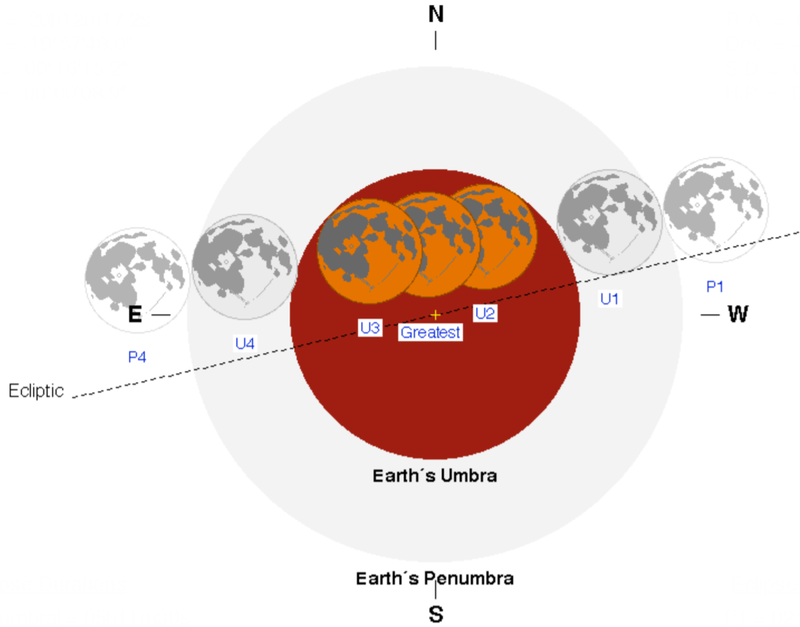 Another remote observations of lunar eclipse are here. Now remains nothing like wait until a next total lunar eclipse, which will occur in 2021. There will be quite a few partial and prenumbral, although I won’t be able to hit my observation target from top to toe. Anyhow is still a good opportunity to watch the Moon in a various eclipse configurations, which I wish you all with a very heavy heart. 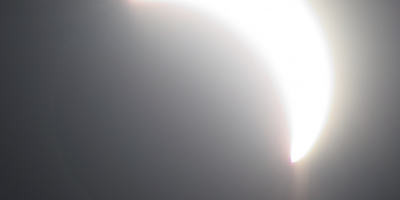 Transit of Venus – have you seen this celestial event?